Looking to inspire your students with a rigorous hands-on, minds-on project in one or more areas of your curriculum? Partner with STE(A)M Truck to receive access to the tools, technologies, and talent needed to make your build a success. STE(A)M Truck staff support educators through all stages of the process, from brainstorming through the final presentation. We work directly with students and their teachers to ensure that students are driving the work and learning to use tools and methodologies to execute their projects. Contact us today to discuss your next big idea. Serves up to 75 students (25 students per class/hour) over 18 hours. STE(A)M Truck has facilitated Big Builds with students across grade levels and subject areas. Check out a sampling of the projects we've done, then contact us to discuss ideas for your classes. Students create a weather station using Arduino-powered sensors and a GoPro. Those sensors are carried high into the sky by a helium-filled weather ballon to collect photo, video, and data. Students design and build a wave pool device that will simulate a tsunami. They then use this device to design and test structures and vehicles that can survive one of nature's most powerful forces! Students combine an interest in pursuing more active, healthy lifestyles with their classroom learnings about sustainable forms of energy to devise and create a blender powered by a bicycle! Students learn to solder, use a laser cutter to create and assemble a wooden housing, and investigate the power of the sun to build Bluetooth speakers and listen to music out loud. 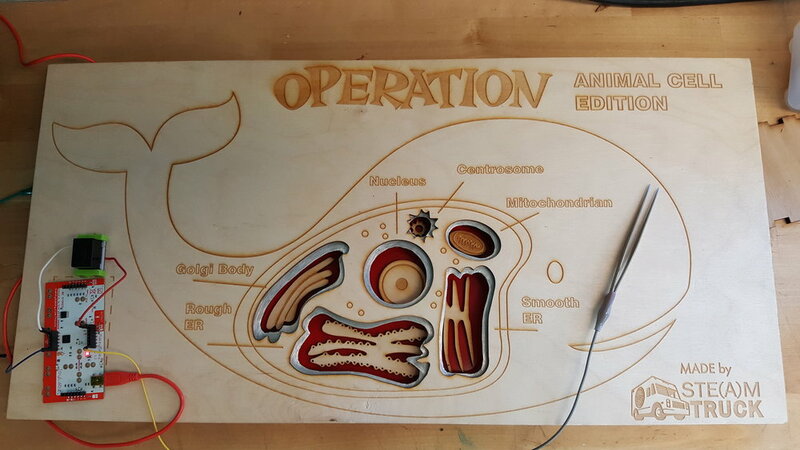 Using basic circuitry (with MaKey MaKey) along with the laser cutter and a variety of other hand and power tools students create their own custom Operation-style board game to learn the structures of an animal cell. Rube Goldberg was an American cartoonist for which this style of contraption was named. A Rube Goldberg machine is a deliberately complex contraption that performs a very simple task. Students will work together to build their very own version, all the while learning about the six classical simple machines and essential physics concepts. Students enlist STE(A)M Truck tools and mentorship to create a meaningful solution to a problem in their community. From gamifying the collection of healthy food for a local food bank to helping a fellow student overcome disability to realize her dream of becoming a filmmaker, students drive the process from ideation through final design. What makes STEAM meaningful and relevant for your students and teachers? We love coming up with new and innovative ways to bring STEAM to schools. Let us partner with you to create a custom Big Build for your school. A Big Build includes up to 18 hours of hands-on programming, serving up to three classes of students for 5 days (approx 3.5 hours per day). If desired, we can serve more classes and more students per day. Each additional hour onsite is $125. Additional materials fee may apply for class sizes over 25 students.